The TEDTalk above features an interesting presentation by Ellen Dunham-Jones about the future of suburbs. She touches on the formation, growth and predicted decline of the suburb in American culture and theorizes about some of the societal, economic and environmental repercussions. In general, the talk left me optimistic about the place we call suburbs and how they can be made to suit our needs going forward. Ellen Dunham-Jones teaches architecture at the Georgia Institute of Technology, is an award-winning architect and a board member of the Congress for the New Urbanism. She shows how design of where we live impacts some of the most pressing issues of our times -- reducing our ecological footprint and energy consumption while improving our health and communities and providing living options for all ages. Dunham-Jones is widely recognized as a leader in finding solutions for aging suburbs. 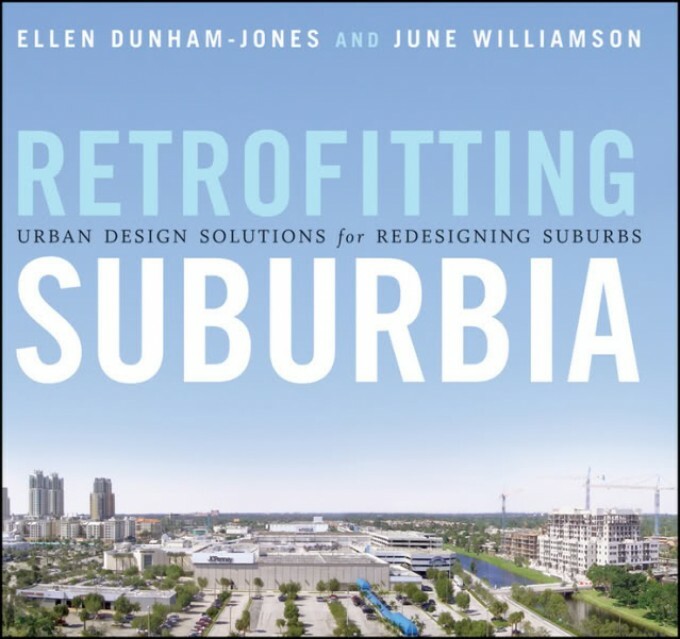 She is the co-author of Retrofitting Suburbia: Urban Design Solutions for Redesigning Suburbs. She and co-author June Williamson share more than 50 case studies across North America of "underperforming asphalt properties" that have been redesigned and redeveloped into walkable, sustainable vital centers of community?libraries, city halls, town centers, schools and more. For more information please visit TEDTalks or the original article at Grist. September 23rd, 2010 at 10:15 PM. Posted in . Share this post.